SKU: N/A. Availability: In stock Size: N/A Shipping Weight: 0.5 kg Categories: Accessories, Fall Jewelry, home - for her, WOMENS. Tags: Gloves, Pécsi Kesztűmanufaktúra. To measure the size of your hand, put the tape on the back of the hand, holding it with the thumb and covering the knuckles. 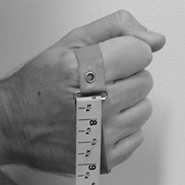 Measure around the hand over the inside of the palm but without the thumb. Close the hand and take the measurement without squeezing too tight. Read off the measurement on the conversion table below in order to find out your glove size.